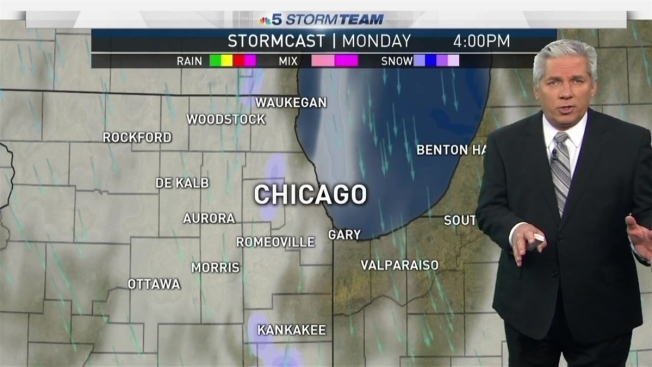 NBC 5 Storm Team Meteorologist Pete Sack has your latest forecast on this Sunday morning. A Winter Weather Advisory will remain in effect for the remainder of the day in areas west and south of Chicago as light-to-moderate snow is expected. The advisory will remain in effect in DeKalb and LaSalle counties through midnight Sunday night, while an advisory will remain in effect in McHenry and Lake counties through 6 a.m. Monday morning. Anywhere from one to four inches of snow is expected to fall in those areas, and the National Weather Service says that roads could become slippery as snow will fall at a mostly steady rate throughout the day. In areas closer to Chicago, less snow is expected, with one to three inches possible in the city and nearby suburbs. Further south, only an inch or two of snow is expected, according to our latest forecast models. Temperatures will settle around 30 degrees in most locations for the high on Sunday. Later in the week, a rain and snow mix is expected to hit the area on Wednesday, which could cause some travel concerns as temperatures will hover around 35 degrees during the day.